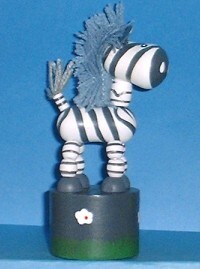 This wooden zebra push puppet has a mass of gray yarn (wool) as a mane. The base has been hand-painted with small daisies and grass. His ears are made from a vinyl-type material..